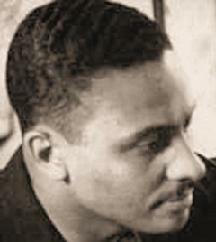 Elmer Simms Campbell (January 2, 1906 – January 27, 1971) was the first African-American cartoonist published nationally. He workd for Esquire Magazine and was the creator of "Esky", the famous pop-eyed mascot that represented the magazine. He was a native of St. Louis, Missouri and the son of teachers. He was the cartoonist for his high school's weekly newspaper. He was a graduate of the Chicago Art Institute. During a job as a railroad dining-car waiter, Campbell sometimes drew caricatures of the train riders, and one of those train passengers, impressed by Campbell's talent, gave him a job in a St. Louis art studio.He spent two years at Triad Studios before moving to New York City in 1929. After a month, he found work with the small advertising firm Munig Studios, and began taking classes at the Academy of Design. He contributed to various humor magazines, notably Life, Judge and College Humor. Following the suggestion of cartoonist Russell Patterson to focus on good girl art, Campbell created his "Harem Girls," a series of watercolor cartoons which attracted attention in the first issue of Esquire. Campbell's artwork was in almost every issue of Esquire from 1933 to 1958.